Galactus, Devourer of Worlds, hates all life as we know it—so of course it makes sense that he would hate Mondays too. An upcoming issue of Unbeatable Squirrel Girl features a number of guest artists creating standalone comics for the zine that Squirrel Girl and her super-powered friends have put together. Artists include Michael Cho (Papercut), Rico Renzi (Jessica Jones), and Garfield’s beloved creator, Jim Davis, who was asked by Unbeatable Squirrel Girl writer Ryan North to create a comic for Galactus. 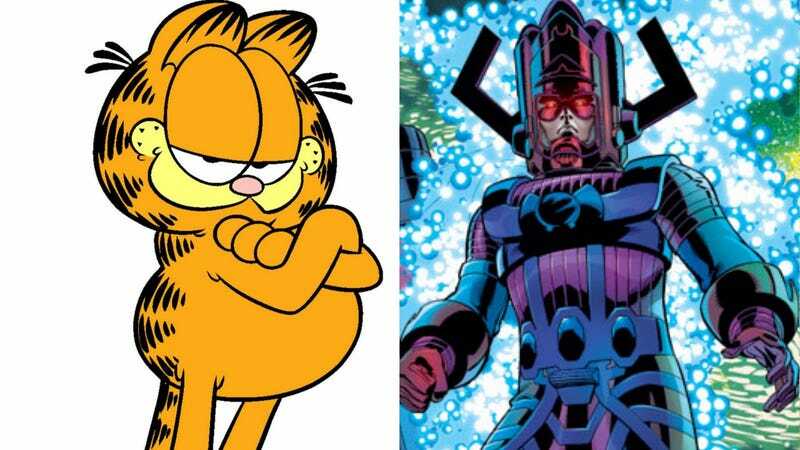 In an exclusive preview, Davis told Entertainment Weekly that North thought Galactus and Garfield were two peas in a pod, given their love of eating things—even though one prefers lasagna, while the other chomps on galaxies. David ended up styling Galactus as Garfield himself, while turning the Silver Surfer into Jon. Apparently, the Surfer was a dead-ringer for the beleaguered pet owner, but it was a little harder turning Galactus into a giant, lazy cat. “We were throwing stuff back and forth, and the initial sketches just weren’t working for Galactus. I said, ‘Okay, we gotta make him fat. The guy eats planets, for god’s sake!’ Once we do that, it’s a little less Galactus but certainly a lot more Garfield. It looked more natural. Obviously, Galactus has put on a few mega-tons for this strip,” Davis said. Issue #26 of Unbeatable Squirrel Girl comes out Nov. 8. You can check out a preview below, courtesy of EW.